5.5K. 1.5K more than last week. Around 5-10 mins/day work, 10mins/day AFK. I'm actually surprised how unchallenged my bag, recipe and alliance-pet businesses are. I met some competition in the bag business and someone sold cat pets in the common AH, but that's all. It seems like a solid income with little work. It seems that there are enough niches for all businessmen, so no one is motivated to take mine. I'm thinking about concluding this experiment. Now comes the experiment after the experiment: Would you pay $20 to have your character transfered to the server you usually play on, to recover the 5000 gold? Or do you just let the gold rot there? Basically the question is whether gold is worth any real money to you, if, like in this case, you can "buy" it legally. I'm going to go on a limb here Tobold and say that the Goblin would never ever pay irl cash for gold. There are so many ways to make money in WoW (as in any MMO) it boggles the mind how many people whine and beg in the major cities. 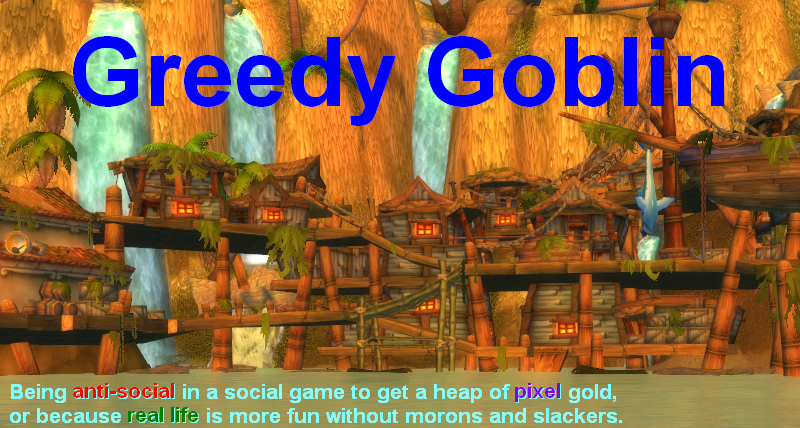 Indeed a Goblin would not pay for gold, and something tells me that your not going to give it away either. A true goblin would sell off to farmers enough gold to make $20 and then use that money to transfer the character, giving at least some net profit to his main character. I imagine the server will really feel the loss if you do conclude the experiment. Gevlon couldn't spend the money he has on his mains if he wanted to. He would have to give it away. This 5k is chump change for him. However, I like Tobold's question. By transfering the character it really would by like buying the gold. Sadly, the common AH on Mannoroth is chock full of people trying to sell Alliance only pets. In theory, you could make plenty of money still, maybe 6-7/pet, but no Horde seem to be buying. Interesting the differences between servers. Yes, we can conclude that you can make gold by finding a niche market. How about for your next one you allow the readers to pick a craft that you have to level up and then profit from. I would find it interesting to see you take something like engineering and make 5k gold in your 10 minutes a day strategy.